Link back to page one. Before we go inside let's walk around the outside of the hotel. Heading around to the left from the porte-cochere (east) side of the hotel we find a round, heated swimming pool, which was installed in 1963. From the pool a sweeping stairway leads up to the guest floors, so that guests in swim wear do not need to walk through the lobby to reach the pool. Adjacent to the pool a creek borders the hotel grounds; a small pedestrian bridge crosses the creek to the Ahwahnee Cottages located on the other side. 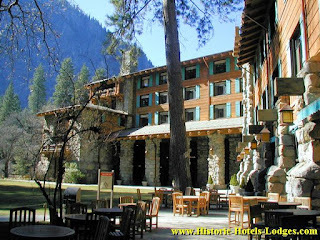 To the south of the hotel is a patio with tables and beyond is the large Ahwahnee Meadow. Bordering the far side of the meadow is the Merced River. The meadow wraps around the hotel on the west side with ranger housing on the far side. 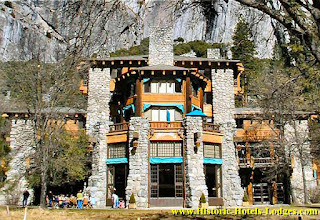 If you walk out into the Ahwahnee Meadow and then turn around you finally see it... the grand front facade of the hotel. Much more impressive than the other side! (More on why the hotel faces backwards later.) The surrounding landscape is, well, Yosemite Valley! Tall trees, towering cliffs, massive rock domes, waterfalls. What more can I say? The hotel exterior blends well with the surroundings. The rock walls match the color of the surrounding cliffs. The somewhat pyramidal design of the 6 story tall structure tends to make it less imposing. The exterior light fixtures are ornate copper and iron fixtures and give a perfect rustic accent. The way the hotel sits on its site and blends with the surroundings is outstanding. The hotel was designed by architect Gilbert Stanley Underwood, and is considered a masterpiece of architectural design. 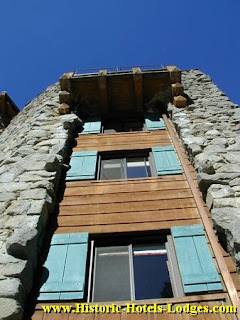 The hotel construction is primarily concrete and rock with the goal of making it both durable and fire-proof. With the exception of the window shutters, all of what appears to be wood is actually concrete, including the roof trusses and beams that protrude from the walls under the balcony at the top of this photo. The concrete was cast with wood grain in the finish and is hand-painted to look like redwood. If you examine the side of the building carefully you will notice that wood grain pattern repeats itself throughout the building where they reused the same molds. Look at the "board" just above the lower window in this photo, then move up two boards and you will see that although painted different, the knot locations in the two boards are identical! Now let's go back around to the porte-cochere on the back of the hotel, and take a look inside. Free National Park Photos by Jess Stryker. "Stock" Photos taken by Jess Stryker primarily of America's Regional and National Parks. Plus lots of other photos of various things like flowers. Most of the photos are FREE for you to use; free to download, no sign up required, and no royalties! Yes, they really are free and can be published. CC-BY-4.0 licensed. Please note that each of these photo essays represents a "point in time", the appearance in the photos is how the hotel or lodge looked when we visited. 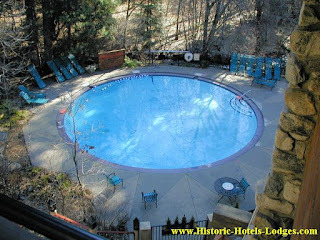 Guest properties like these remodel frequently so appearance and amenities may have changed since our visit. This is especially true of the guest rooms. Businesses come and go as well, and sadly some of the hotels we have featured in these photo essays are no longer operating. Please contact the hotel or lodge for updates before you visit! Historic Hotels & Lodges is an independent website and is not related in any way to any of the hotels featured. We are not paid nor do we charge a fee to feature hotels on this website. Please note that most of the photos are copyrighted. © Jess Stryker, 2005 - 2018 All rights reserved.. Watermark theme. Powered by Blogger.